Sherpa’s founders are seasoned, successful entrepreneurs on a mission to transform the car shipping industry. Over the course of several cross-country moves, we experienced how unreliable the car shipping industry can be. From dented bumpers to no-show drivers, we saw the worst that’s out there and knew that we could do better. Much better. Our Clean Car Guarantee, a new program we’ve rolled out, is just one way we’re disrupting the auto transport industry and improving the customer experience. We decided to apply our expertise in business leadership, technology and customer care to the tired, unreliable auto transport industry. The result? Superb service and safety are our guiding principles. Our proprietary ranking and scheduling algorithms ensure that your vehicle is paired with a driver who has an impeccable service and safety rating. We track carrier performance to ensure that only consummate professionals are handling our customers’ vehicles. We stand beside you 24/7, offering real-time updates on the progress of your vehicle throughout its journey. Sherpa is driven to provide what every car shipping customer deserves: a transparent and stress-free auto transport experience. We are the car shipping company you can count on during all of life’s transitions. We believe every client deserves a customized and personable experience no matter the vehicle you ship – be it a prized sports car, an irreplaceable classic showpiece or the well-loved family SUV. We partner with the most trusted auto moving professionals in the industry, offering decades of experience and impeccable track records of safety and service. For your peace of mind, we and our drivers are licensed, bonded and insured. 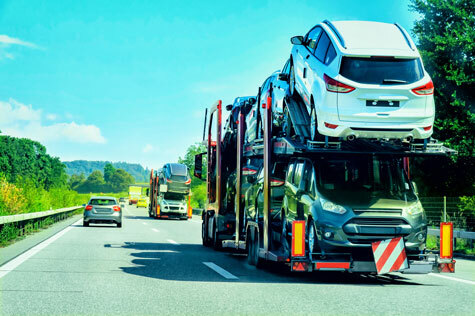 When you choose Sherpa, our dedicated experts work with you to create a custom vehicle shipment plan, schedule and quote and are available to you at every step of the move, ensuring a smooth, stress-free experience. At Sherpa, we are passionate about providing a better auto moving experience, and this begins with transparent pricing. Price is a function of schedule, vehicle size, and weight, capacity, distance, and timeframe. Using our technology we optimize routes and pass the subsequent savings to you. Whether you are primarily concerned with timing or savings, we will ensure that your needs are met. We offer the entire range of auto transport solutions, from standard open-carrier options for personal autos, to enclosed-carrier services for antique, exotic and collectible cars. We move everything from family cars and classic roadsters luxury or collectible vehicles. One call to 877-850-1231 answers all your questions and meets all of your car shipping and commercial auto transport needs.